This unofficial obituary was compiled by Tom Wahl and Raymond Merritt from information gathered in our search for lost classmates. February, 2010. Christina Susan Goodwin was born December 29, 1942. She attended Hall High School as a sophomore in 1957-58. While at Hall, she lived at 6704 Beacon in Little Rock with her stepfather, Omar D. Cauby, and her mother, Kathleen. Omar was a 1946 graduate of Little Rock Central High School and Susan was 12 years old when he married her mother. When the Little Rock schools were closed in 1958 and the Class of 1960 dispersed, Susan (as we knew her) went to C. E. Byrd high school in Shreveport, Louisiana, where she graduated in 1960. At C. E. Byrd, she was known as Christina. Her family origin was Great Britain and after graduation Christina married a physician, Dr. Charles Ebrill, MD, and moved to Wells-Next-The-Sea, England. They had two daughters and, as of 2009, one granddaughter. Late in her life, she had to have a kidney transplant. It was successful but the kidney later failed, causing her death. 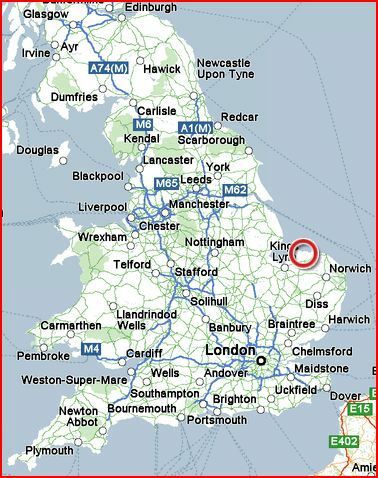 Wells-Next-The-Sea is circled in red on the map below.